There’s no business like showbusiness. Dustin Hoffman’s directorial debut gives us the bittersweet epilogue after that show goes on. Quartet is based on the 1999 play of the same name by Ronald Harwood. Like most films based on plays, the action is centered around a single locale, the Beecham House, a unique retirement home for musicians. Unlike most films based on plays, the beautiful Buckinghamshire landscape and deft use of light and open spaces never constricts the transition. Hoffman has skillfully adapted the play to the screen and handles the camera well. His choice of leads is equally keen. Quartet will never receive a wide release in the United States for its cast is almost uniformly old. We’re talking performers in the autumn and sometimes winter of their lives. There are no explosions and no May-December romances; it’s old coots bantering all the way down. A gala is being put on by the Beecham House retirees, one they perform every year in honor of the House’s founder – and also to raise money (such swanky accommodations do not come cheaply). As the house is populated by nothing but old divas and fading virtuosos, there is already drama enough. The situation is escalated by the arrival of Jean Horton (Maggie Smith), once the premiere soprano of the opera and former wife of tenor Reggie Paget (Tom Courtenay). Reggie’s heart never mended after their brief romance 35 years ago, but the gala’s director, Cedric Livingstone (Michael Gambon), knows that if Jean performs the Beecham House will be solvent and the show will be a smash. Cedric charges Reggie with reuniting his famous quartet. The hitch: Jean is certain that her singing days are behind her and finds the very concept of performing embarrassing. She despises her own frailty and is terrified to be any less than what she was. Quartet is a meditation on old age that manages the difficult feat of skirting maudlin territory. The film is very funny, helped in no small part by Billy Connolly, who plays Reggie’s best friend and resident randy Scotsman. The old comedian easily steals every scene he’s in. He is part of the quartet that performed the “Bella figlia dell’amore” from Rigoletto, along with Cissy and Jean, and he is eager to perform again. Pauline Collins as “Cissy” Robson injects verve into the elderly cast as an energetic little thing in the early-to-middle stages of Alzheimer’s. Her infirmity is never treated disrespectfully but her cheerfulness and forgetfulness make her a humorous match for Connolly and Smith. The message here is unequivocal: It really isn’t fun getting old. For Beecham’s retirees, that fact is doubly felt. The loss of talent, the nostalgia for brighter days, the gradually increasing loneliness, these are all magnified in performers. The thrill of the stage and the adulation of the crowd is an intoxicant devoutly to be missed. Though Quartet’s English vistas are charming, they do not hide the truth. But the film does not despair. The vigor of life still exists in the joy of performance. Though old wounds remain, Beecham provides a place of belonging, a chance to find a dignified final act. 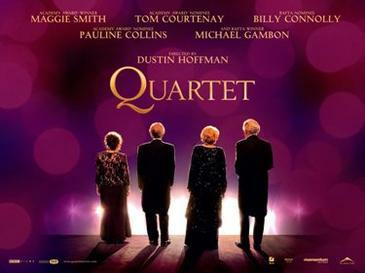 Quartet is a fun, funny picture, stirred by great performances and an ancient truth: There is no business like showbusiness, and showpeople are in the business for life.